Your Neighborhood Automotive Repair Specialists! Our technicians are professionally trained and certified to diagnose today's complex electronics, perform routine maintenance and repairs on any automotive vehicle's systems. Using state-of-the-art equipment, certified training and years of experience, if it drives - our technicians can fix it! Proper scheduled maintenance is paramount to the longevity of your vehicle. Following the factory recommended maintenance schedule for your vehicle will help ensure continued safe operation, engine performance and fuel economy. We are a Certified CT Emissions Repair Facility with 2 emissions-certified technicians! "We deliver Dependable Auto Repair, Exceptional Customer Service using High-Quality OEM and Aftermarket Replacement Parts all backed by our 2 year, 24,000 mile warranty"
- Wallingford Tire & Auto. Oil Changes - Chassis Lubrication - Fluid Top-offs - Tire Rotation & Balance - Air Filter Replacement - Antifreeze Testing - Multi-point Inspection - Windshield Wiper Replacement - Comprehensive Inspections - Vehicle Pre-purchase Inspection - Factory Scheduled Maintenance (30K, 60K, 90K, etc.) - Cabin Filter - Transmission Fluid Service - Power Steering Fluid Service - Transfer Case Fluid - Differential Fluid and more. System Diagnosis - Disc Brake Service - Drum Brake Service - Brake Fluid Flushing - Wheel Cylinders - Calipers & Rotors - Wheel Bearing Service - ABS Diagnosis - Parking Brake Service - Master Cylinder - Power Brake Booster - Hose Replacement - Brake Line Fabrication & Installation and more. System Diagnosis - Cooling System Flush - Radiators - Thermostats - Water Pumps - Hose Replacement – Leak Testing – Cooling Fans – Oil & Transmission Coolers - Overheating Diagnosis and more. Battery Testing & Replacement - Electrical System Diagnosis - Electrical Wiring Testing & Repair - Alternators - Starters - Power Windows & Door Locks - Headlight & Bulb Replacement - Power Accessories - Electronics Diagnosis - Spark Plugs - Instrument Panels - Ignition System Service - Fuel System Testing - Fuel System Maintenance - Fuel Injection Cleaning - Fuel Pump - Fuel Tank - Fuel Hoses - Steel Fuel Lines - Fuel Gauge - Fuel Filter - Fuel Regulator - Sensors and more. Shocks & Struts - Springs - Bushings - Control Arms - Knuckles - Wheels & Tires - Wheel Alignments - Rack & Pinion - Suspension Upgrades - Tie Rods - Ball Joints - Idler Arms - Pitman Arms - Power Steering Pumps & Hoses - Electronic Ride Control and more. Check Engine Light Testing & Repair - Tune-ups - Timing Belts - Serpentine Belts - Factory Rebuilt Engines - Computer Diagnostics - Head Gaskets - Oil Leak Repair - Exhaust Systems - Certified Emissions Repair - CV Boots & Joints - Drive Axles - Driveshafts and more. System Testing & Repair - Air Conditioning Service - Heater Core - Heater & AC Controls - Heater Hoses - Air Conditioning Lines - Heater Control Valves and more. 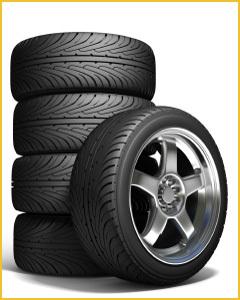 Tires are the safety link and the power transfer between your vehicle and the road. They control handling, ride, performance, fuel economy, noise and traction. We understand that buying new tires can be overwhelming and stressful so let our years of experience and training take the mystery and anguish out of this experience. We offer most major brands of passenger, performance and light truck tires and our sales staff will discuss each tire’s benefits and features, and will recommend the right tire for your vehicle and budget.